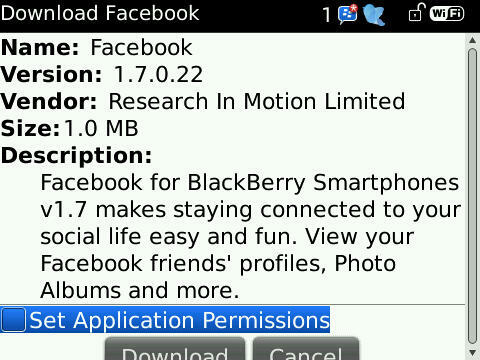 We just got word that Facebook has been updated to version 1.7.0.22. No notes on what is new, but most likely nothing major. The last release was a pretty decent overhaul, so I would think nothing more than a few tweaks and bug fixes this time. 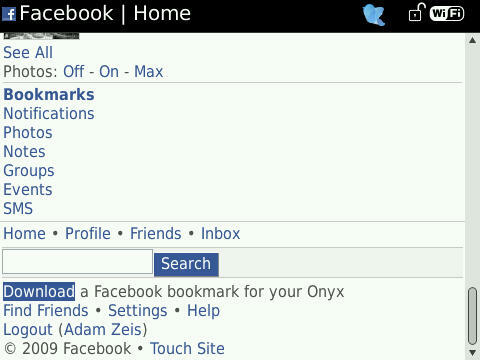 You can upgrade by heading over to blackberry.com/facebook from your device. On a side note, check out the image after the jump. I tried to upgrade the app from the Facebook mobile site on my Bold 9700 and saw "Download a Facebook bookmark for your Onyx". The link took me to a download page for a launcher of some sort. On every other device I have I've been able to download the app from the same page. Just found it interesting to say the least.